BRUSSELS Greece passed another hurdle in its bailout program Monday, securing installments of the rescue package that is keeping the cash-strapped country afloat. Greece's creditors approved the release of 6.8 billion euros ($8.7 billion) in funds over the next few months, provided the country sticks to the reform agenda it agreed to in return for the funds -- including the firing of several thousand civil servants. Experts from the European Central Bank, the European Union and the International Monetary Fund said Monday that the country's reform program, implemented in exchange for rescue loans, is largely on track, although it's moving too slowly. They also warned that the country's economic outlook remains uncertain. But they still recommended that the next loan payments be made, and the finance ministers from the 17 countries that use the euro agreed. Belgian Finance Minister Koen Geens said the loans would be divided into three groups and disbursed in July, August and October. "Greece is getting on track," German Finance Minister Wolfgang Schaeuble said as he left the meeting in Brussels. "It is not easy for them." 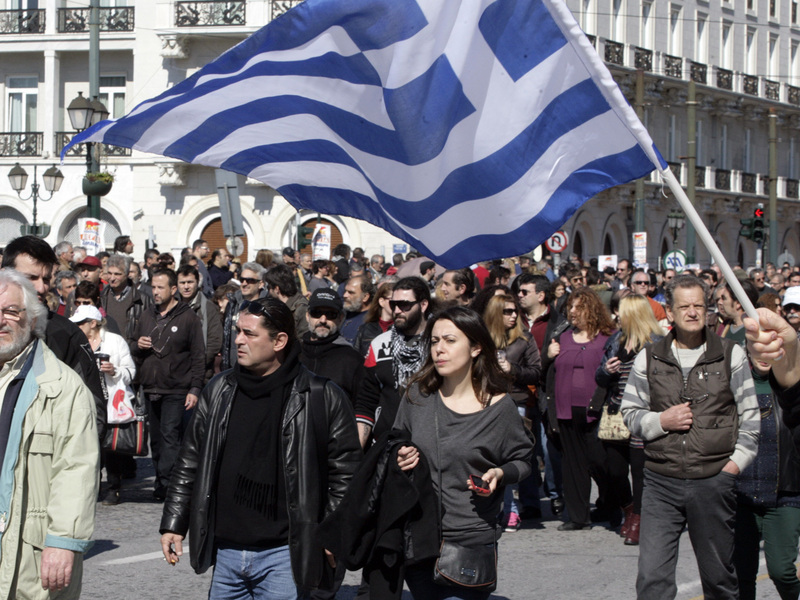 After years of overspending, Greece nearly went bankrupt and is now surviving on rescue loans. To ensure that the government keeps up with the reforms it promised in exchange for 240 billion euros in bailout loans, its creditors turn over the funds slowly -- and only after rigorous assessments of the country's progress. Hammered by a financial crisis since late 2009 and in the sixth year of a deep recession, Greece's creditors, known as the troika, said the country's reform program remained "broadly in line" with projections. It also laid out the hope of a gradual return to growth next year. However, it added that "the outlook remains uncertain." The troika said "policy implementation is behind in some areas" and that the Greek authorities have said they will do more to ensure delivery of the fiscal targets for 2013-'14, noting in particular efforts to restrict overspending in the health sector. The government has also "committed to take steps to bring public administration reforms back on track," including reducing the number of civil servants, one of the measures that has been among the most contentious in Greece's reform program. "Firing civil servants is always difficult; that is difficult in every country, certainly in such economic circumstances," said Jeroen Dijsselbloem, who is head of the eurogroup meeting and Dutch finance minister. The government must put 12,500 civil servants on administrative leave by the end of the year, with the possibility of dismissal. They include 2,200 school security personnel; 3,500 members of the Athens municipal police, which will then be disbanded and absorbed into Greece's police force; at least 2,000 local government employees; 1,500 teachers; and employees of various ministries. They will be paid 75 percent of their normal salary and be subject to dismissal if they aren't transferred to other state agencies within eight months. Municipal workers across the country went on strike to protest the plan, while the country's civil servants union, ADEDY, called a work stoppage from noon for all civil servants in the capital, Athens. The austerity reforms, agreed to in return for the loans, have included big salary and pension cuts as well as repeated tax hikes. This has contributed to the country's years-long recession and unemployment's spiraling to above 27 percent.